On the nose, this whiskey smells earthy to me. There is some mint there, which reminds me I’m drinking a rye. There are also some herbal notes to it, like basil leaves or musty oregano. The palate has a nice medium body with a nice entry of cinnamon, ginger, and some vanilla. It is definitely a hot, intense whiskey. You know you are drinking it at 100 proof when it is drank straight. Water lessens the heat, but it does not open the flavors or the bouquet up at all. The finish is long, minty, and a little spicy. Overall, I am not impressed with this whiskey. It is a solid rye, with a lot of rye heat. However, there really is not much depth or complexity to this one. I would like to see what would happen if Jim Beam released an older rye, maybe something like ten years. I think some of the sweetness of the barrel would add complexity to the whiskey to save it from the one dimension of rye in this whiskey. My grade: C. Price: $35-40/750ml. This would be a nice whiskey to have around for mixed drinks if it was half the price (in my humble opinion). I finally got my hands on a sampling of the newest release from Jim Beam’s Small Batch Collection, Knob Creek Single Barrel Reserve. Like the very popular Knob Creek Small Batch, the Single Barrel Reserve is aged 9 years. However, the Single Barrel Reserve is bottled from a single barrel, and it is also bottled at 120 proof (60% abv). I have reviewed the Small Batch already on this site, and I am not a big fan of it, especially at a price point over $30. I was anxious to see if the Single Barrel Reserve smoothed over the powerful oak that dominates the Small Batch. I am happy to say that Knob Creek Single Barrel Reserve is a big step up from the Small Batch. The first thing you will notice about Knob Creek Single Barrel Reserve is the rich, auburn color. This whiskey is very dark, which is indicative of the high alcohol content. The nose is full-bodied, with a good balance of sweetness and oak. There are notes of maple syrup, brown sugar, and viscous caramel balanced by powerful, dry oak. The palate starts sweet with the same brown sugar sweetness from the nose, but it moves towards spicy, peppery oak at the back of the palate. This whiskey is very full-bodied, indicative by the almost chewy mouth feel. The finish is lengthy, but especially oaky. Some of the sweetness and richness of the nose lingers for a while, but the peppery oak from the back of the palate dominates the finish, leaving a prickly wood spice for a good while. Overall, Knob Creek Single Barrel Reserve definitely smoothes out some of the problems of Knob Creek Small Batch. However, the oak still dominates the whiskey, which is not my favorite taste profile. This is a very good whiskey, especially if you love an oaky whiskey. However, for my personal palate, this is not the bourbon for me. It is only a few dollars more expensive than the Small Batch, so between the two Knob Creek offerings, I would definitely buy the Single Barrel Reserve. My grade: B/B-. Price: $40-45/750ml. This is a nice whiskey to warm up in the winter, but it is a high price tag to pay for my standard sipper. 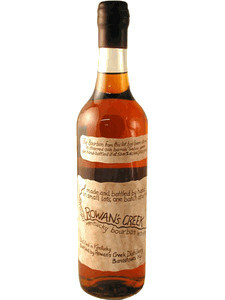 Rowan’s Creek is the first bourbon I’ve reviewed that comes from the Kentucky Bourbon Distillers (KBD) line of bourbons. Rowan’s Creek comes out of a small batch collection that includes one of my choice bourbons, Noah’s Mill. Rowan’s Creek is the younger brother in the small batch collection, being aged 12 years to Noah’s Mill’s 15. However, that also means that Rowan’s Creek is cheaper, usually in the same price range as a more popular bourbon like Knob Creek. The two whiskeys have similar profiles, but as you will see, I think Rowan’s Creek is the one I’d rather drink. Like Knob Creek, Rowan’s Creek is bottled around 100 proof, which gives it a powerful flavor profile and mouth feel. On the nose, Rowan’s Creek comes right out and says that it is a big, oaky bourbon. However, it is a sweet oak, with some of the burnt sugars from the barrel coming through as the bourbon sits in the glass. There are rich notes of brown sugar, maple fudge, and nutmeg. On the palate, Rowan’s Creek is medium-bodied, with a strong oak character. However, it is backed by some citrus notes (pears, oranges), vanilla, and roasted nuts which add a lot to the whiskey. The finish is strong and of medium length, leaving oak and fresh pepper all over the palate. However, like the nose, the oak has a sweet character to it, with some well-timed vanilla. Overall, Rowan’s Creek is a big, bold bourbon whiskey. One of the most interesting things about Rowan’s Creek is that it opens up very nicely in the bottle. Don’t go through the bottle too quickly, or you might miss this bourbon’s beautiful evolution from a rich, oak monster to a complex, sweet, well-oaked bourbon. It is not going to be everybody’s favorite bourbon, much the same way that people are polarized over Knob Creek. However, between the two, Rowan’s Creek has a lot more complexity. Rowan’s Creek can be a tough bourbon to find, but if you love rich, oaky bourbons, then it is a good bourbon for a good value. My grade: B+. Price: $35-40/750ml. This is very good stuff, but it isn’t quite a top shelf bourbon (but it’s close). I have had a lot of requests for Knob Creek, so here is my review of it. Knob Creek is the oldest bourbon in Jim Beam’s Small Batch Collection (which also includes Booker’s, Baker’s, and Basil Hayden’s). Knob Creek is bottled in two variations, a small batch and a single barrel. Knob Creek Single Barrel is a recent release from Jim Beam, and it has received many good reviews. On the other hand, the small batch edition has been around for a long time, and it has developed quite a following. More so than with many other bourbons, bourbon drinkers are polarized over Knob Creek. Here is my review. Knob Creek is bottled at 100 proof, making it the highest proof bourbon I have reviewed on the site thus far. With craft whiskey, especially craft bourbon, do not be afraid of high proof points; high alcohol content is often accompanied by big, bold flavors (just don’t get carried away sippin’ on 100 proof bourbon). It is also a little more expensive than most bourbons that I have reviewed, but it is still an extremely popular bourbon. 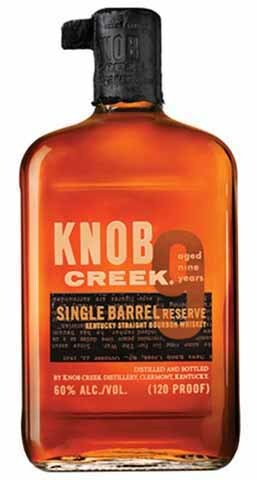 Knob Creek opens with a good nose, with most of the notes coming from the barrel (charred sugar and oak), but there is some caramel and maple sweetness that comes through. There is some balance early on in the palate (maple, cinnamon, caramel), but the finish is dominated by the roaring oak that dominates this whiskey. The finish is long and very warming, but it is primarily dominated by the barrel’s flavors. Knob Creek is a strong, bold bourbon, but I think it is too single-minded. I wish there was a little more balance in this whiskey, but I definitely recommend that you try it for yourself to see what you think. My grade: C. Price: $30-35/750ml. This is a solid whiskey, but it is not worth the money (in my opinion).